Cryotherapy was originally developed in Japan in 1978 for the treatment of rheumatoid arthritis, and the benefits have been studied and refined in Europe since that time. 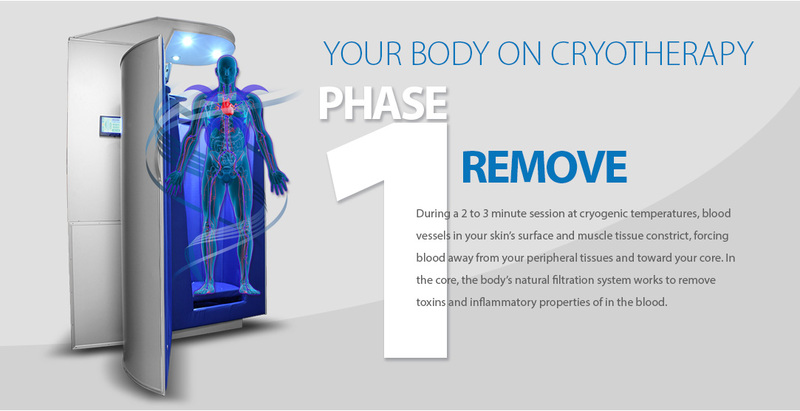 Cryotherapy is now utilized in the United States, and with wonderful results. Most cryo-saunas uses liquid nitrogen, lowering the client’s skin temperature to about 30 to 50 degrees F in a period of two or three minutes. Liquid nitrogen is used to make the cold, but clients are not in direct contact with the gas. Our skin reacts to the cold, sending messages to the brain, and it stimulates regulatory functions of the body, assisting areas that might not be working to their fullest potential. During this time, thermoreceptors in the skin send signals to the brain to send the blood to the core to maintain body temperature with a process called vasoconstriction. Toxins are flushed from peripheral tissues, and blood is enriched with oxygen, enzymes, and nutrients. The body activates all of its natural healing abilities and releases endorphins for further benefit. As the body warms up again, the enriched blood flows back through the body through a process called vasodilation. 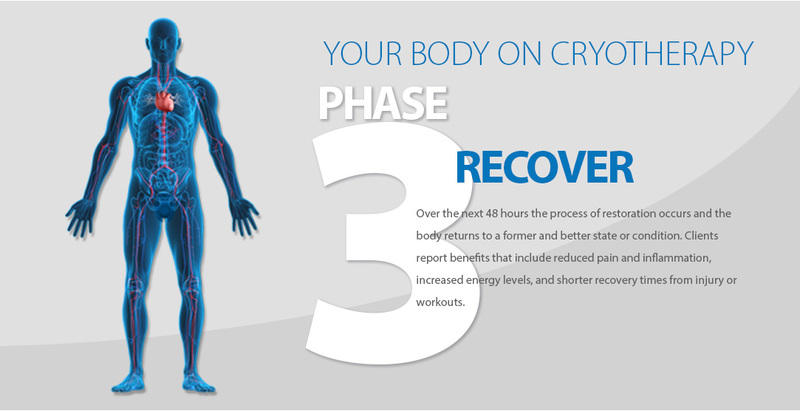 As a result, whole body cryotherapy is very effective for athletic recovery and muscle repair, reduction of chronic pain and inflammation, and an overall enhancement of health and wellness. 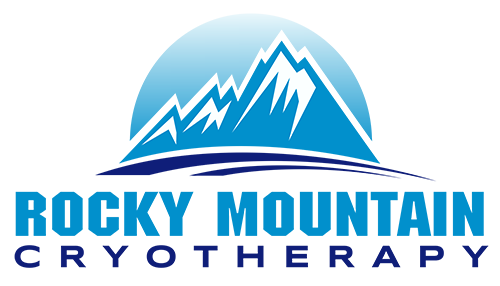 All whole body cryotherapy sessions are conducted by a trained and certified Cryotherapy technician who remains with you for the duration of your session. Inside the cryochamber you will only be wearing socks, slippers and gloves; men also wear briefs. This allows for 90% of your skin to be exposed to the hyper cool air. It is fine to leave your hair down and have on face lotion or makeup. We ask that you do not apply lotion or any moisture to your skin an hour before your session. No jewelry or metals can be worn below the neck. 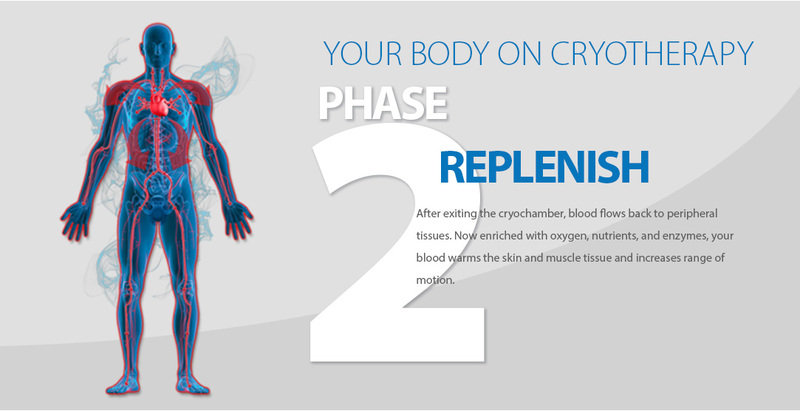 To read and/or download the complete Whole Body Cryotherapy FAQ, click here. Whole Body Cryotherapy is not simply a faster version of an ice bath. The body’s reaction to low temperatures while submerged in an ice bath (7°C/45°F) is radically different from its reaction to cryo temperatures (lower than -110°C/-166°F) in the cryosauna. Conversely, in the cryosauna (also known as a cryotherapy chamber or cryotherapy unit), the body constricts peripheral tissues sending blood from the skin surface, muscle tissue, and surrounding joint space to the core to protect core temperature (vasoconstriction). As the blood travels to the core it passes through the cardiovascular system where it is cleansed of toxins and supplied with oxygen, nutrients, and enzymes. As long as the exposure to the extremely cold temperature continues the body continues to flush the tissue of toxins and circulate blood between the cardiovascular system and the vital organs on a continuous loop. This continues to cleanse the blood over and over while continuing to add oxygen, nutrients, and enzymes. Once the participant exits the cryosauna, the body immediately begins vasodilation, returning the enriched blood to peripheral tissues that have been cleansed of toxins. The key to this difference is the temperature of the environment, the skin surface temperature, and the speed of the reduction of the skin surface temperature. In an ice bath the temperature can only reach 7°C/45°F while the temperature in a cryosauna/cryotherapy chamber can reach -170°C/-270°F. This means that skin surface temperature in an ice bath can only reach 5°C/41°F after a wet, prolonged, and often painful session while skin surface temperature in the cryosauna reaches -1°C/30°F in just 30-40 seconds and the total length of time the skin is exposed to this invigorating, dry, temperature is never more than 3 minutes. During an ice bath, tissue begins to freeze and muscles temporarily lose capacity. Muscle tissue then needs time to return to normal which requires the body to rest. Therefore, an ice bath must be scheduled at the end of a rigorous workout so the participant can recuperate overnight. In contrast, the cryosauna/cryotherapy chamber does not actually freeze muscle tissue. It only creates a powerful illusion that the body freezes. In fact, upon exit from the cryosauna, the blood flow back to the peripheral tissues warms the muscles almost immediately. 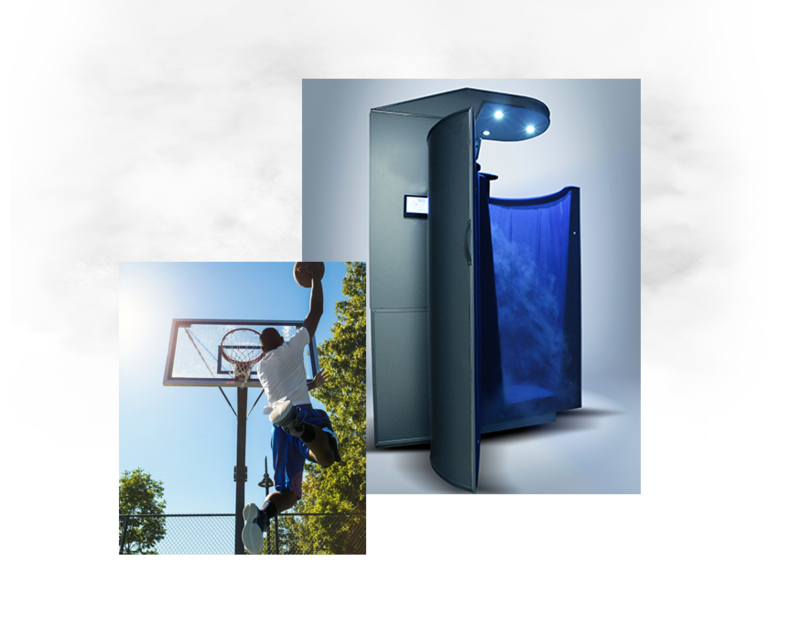 Accordingly, the participant may use the cryosauna both before and after a workout which is an effect that is impossible to realize with an ice bath. Lastly, while in an ice bath, oxygen supply to the skin surface is interrupted, and it causes skin surface injury that can promote skin disease if the procedure is often repeated. Significant health risks may involve the MRSA infection (a bacterial infection that is highly resistant to some antibiotics) if ice baths are not cleaned and maintained properly. There is no such effect in the whole body cryotherapy chamber as the client is surrounded by cold dry air and oxygen supply to the skin surface is not significantly interrupted.